I hadn’t kept up with the 1995 project in a while, so I pounced on Essays in Love: A Novel by Alain de Botton yesterday. It’s a somewhat unusual novel. As it says on the cover, it’s sort of an essay collection, and it’s sort of a novel. So very avantey. But not really. It’s a love story, but the protagonist tends to overthink things. It’s quite amusing. But I just couldn’t get past this bit in the opening section. Our hero is calculating the chance that he and The Love Of His Life were to sit in neighbouring seats on the plain from Paris, given that a) only this woman is TLOHS and b) they both were to take planes from Paris to London that day. Fine. But the numbers are somewhat odd. 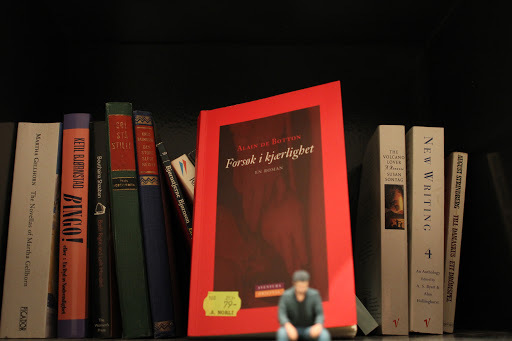 And it doesn’t help that the Norwegian translator is mixing up decimal commas and decimal points, either. 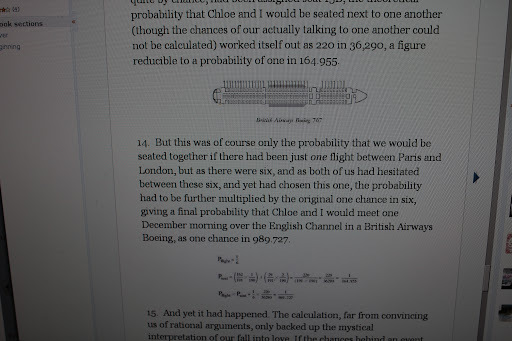 But then we get to the bit where there are six planes, so we should multiply the chance by 36? And we should end up with a change of one in “5 840.81”? And what’s up with all the decimals, anyway? Grr! Pretend precision is Pet Peeve Number 241.456! So while reading half the book, half my brain was kinda going through the maths while the other half was reading the book. And I really don’t have half my brain to spare. I can’t spare even a tenth. There all the numbers are totally different! AAARGH! But they look more sensible there, at least. 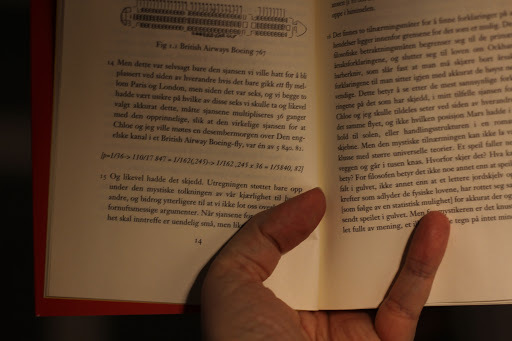 Did the Norwegian translator just throw down some random numbers on the page, or did de Botton fix this in later printings? Could someone check an early (1993) copy of this book in English? With that out of the way, I could finally pay more attention to the rest of the book, which made me notice stuff like the thing above. 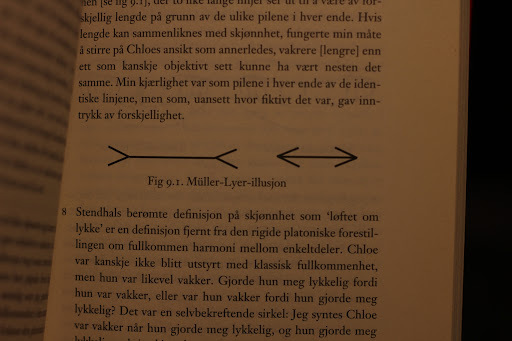 It’s supposed to be an illusion, but the longer arrow is 3mm longer than the short one. I’m totally open to the idea that de Botton would do something like that on purpose just to annoy us nerds, and if so, I applaud him. Maybe the translator also “improved” the illustration?